Earlier I already post many other brand repeater mode post like, TP-Link, D-Link, Netgear, Tenda etc. Asus a popular name in computer and networking accessories brand. 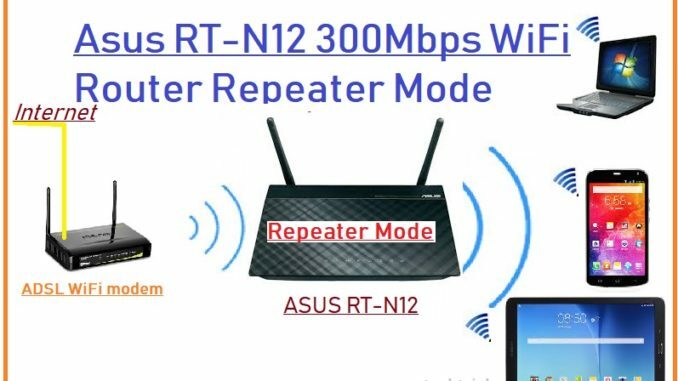 In this post I will give a best and easy way for Asus RT-N12 WiFi router Setup in Repeater Mode Configuration with any brand AP device. Repeater mode use to extend your existing Wi-Fi network to boost wifi signal on every area. WiFi repeater also known as wireless extender or wifi range extender. 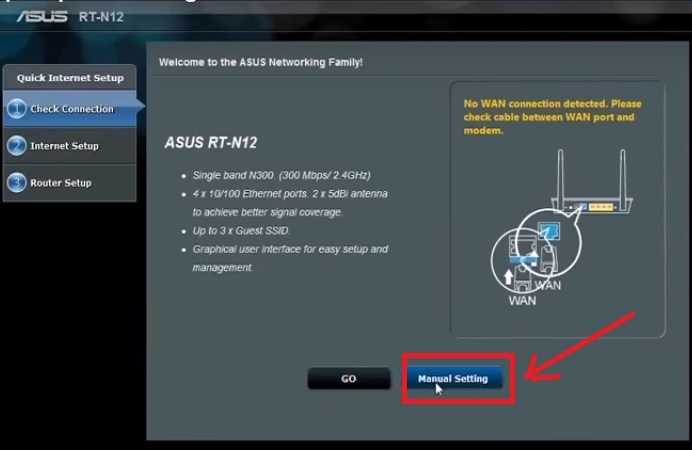 Before going to start Asus repeater mode configuration see brief detail about Asus RT-12N D1 Wifi router. Asus RT-12N is 300Mbps Wireless Router with 2 No. 5dBi Omni directional antenna to give your stronger Wi-Fis signal range. Both wireless antenna detachable so you can remove antenna from router. Asus RT12N support 2.4 GHz signal band with 300Mbps wireless speed. Physical 1WAN and 4 Lan port available for internet as well as wired PC connection. Asus RT12N WiFi router support Access Point, Repeater, and wireless router mode (default Mode). To start Asus rt n12 repeater setup from LAN cable from Laptop ready your laptop with wired connection as given below.Asus RT-N12 Wireless router can be configured with any brand WiFi access point in repeater mode to extend wifi signal. Asus RT-N12 Repeater Setup LAN connection. Avoiding poor Wi-Fi connectivity in your home and office repeater is the best way to extend Wifi router signal. Configuration of any Asus WiFi router model are same. If you are looking user manual for Asus AC repeater mode for dual band router than this post also work with Asus AC router repeater configuration. After physical connection of wifi router next step is access web interface in web browser. To access Web interface your Laptop/ Desktop must be in same series IP Address of Asus Default IP Address. Asus WiFi router default setting also mention on backside of router sticker. You can find Router model number, IP Address, Login detail of Router and Mac address with serial number. Now Open Web browser and Type 192.168.1.1 IP to access Asus wireless router. 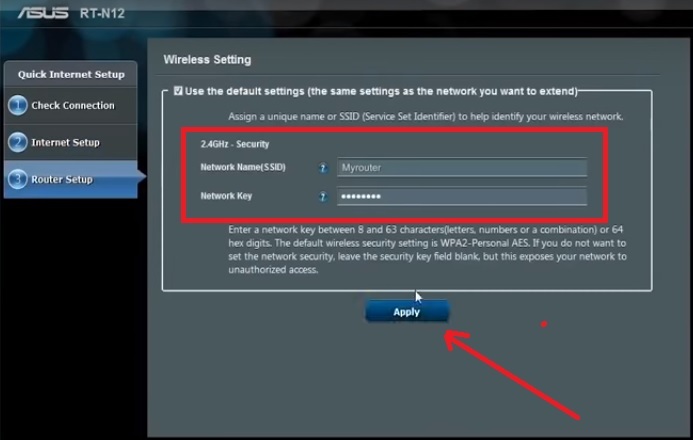 On first time login of Asus router there is no password configured so on first login you required to create new password for access Asus WiFi router. Click Next button to save and proceed to further steps. 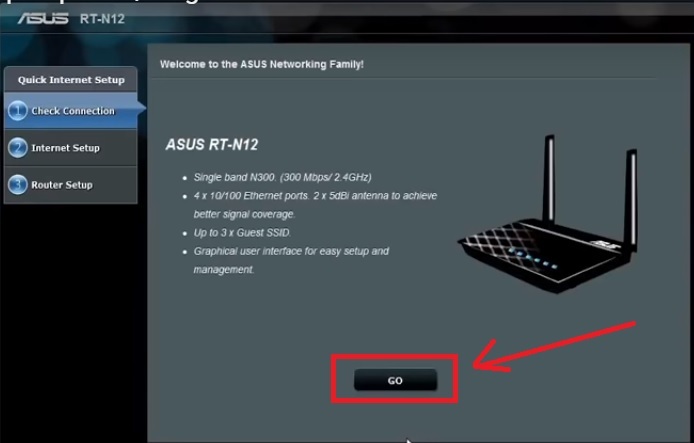 In this step you will get option to choose the mode you want to configure Asus router. 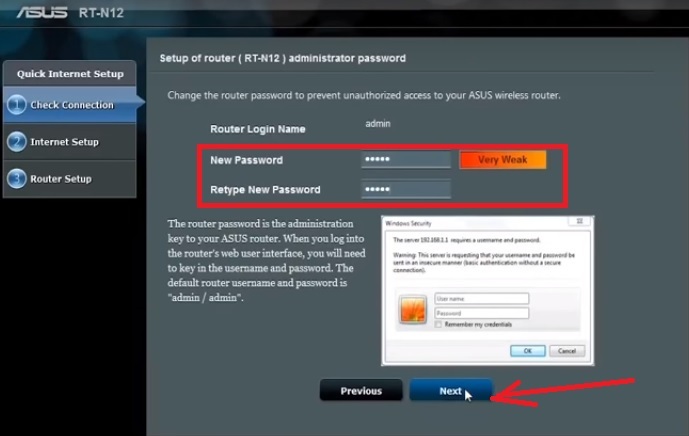 As the this tutorials for Asus router repeater mode so choose the center option Repeater mode here. Join the Main Access Point from Repeater Device. In this step router will take few second to scan all the wireless access point name broadcasting on the area you configure your repeater device. You will get all the available wireless name. 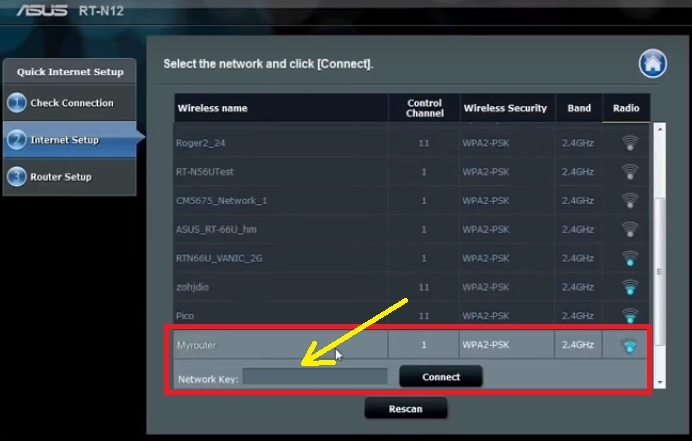 Choose your Main WiFi name and type password to connect it from Asus Repeater device. Network key – password for range extended. Device will take 20-30 second to reboot router . wait until router rebooting. Your Wifi router will come to this windows where you can see router hardware information. Click Go button to enter in connection status. In this status page you can see Repeater connection status and Rang extended Wireless name with password details. 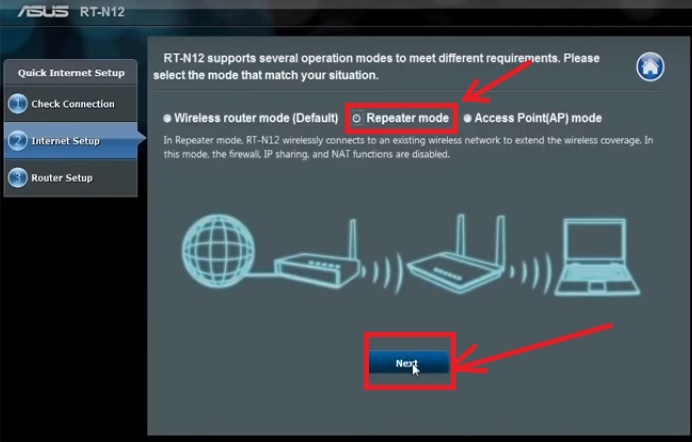 This is the basic and simple tutorial for Asus RT-N12 WiFi router Setup in Repeater Mode Configuration for extended your existing WiFi network to entire home and office area. Using a best repeater device will give your real time connectivity with stable speed and seamless connectivity everywhere. If you facing any type of configuration issue during Asus Range extended setup in with your wifi router please comments problem we will reply asap. Greetings, I followed your tutorial after I ran into issues with my Asus RT N12 and getting it to pass internet. The steps you show are the same steps I took to set the router to extend mode. The issue I’m experiencing is that I cannot get out to the internet when connected to the extended network. It shows that connections are good in the Asus UI, can Connect my phone and laptop to the extended network, but it will not reach out to the internet. When connected to original network I can ping the extender and I can ping original router from the extender. I wondering if the original router has some kind of port block or something going on preventing the extender from doing its thing. The main router is provided by my ISP Spectrum I believe it’s called a Wave2. Any advice would be greatly appreciated! Hi, Try to use the Same security type as using in main wifi router, or see if you mobile getting IP address from repeater device which provided by your main AP.